A commercial version of ProPublica is not “feasible at present”, its editor-in-chief told the Global Editors Network news summit today. The US investigative news site, which relies on funding from philanthropic donations, was launched in 2008. Giving a keynote speech to the event in Hong Kong via video-link Pro-Publica’s Paul Steiger, a former managing editor of the Wall Street Journal, said he did not think a commercial organisation would be able to do as ProPublica does and “concentrate on doing nothing but investigative reporting”. “It is possible that news organisations can have investigative reporting as part of the menu of reporting”, but not to the same extent. The industry has gone from a high profit margin business model to one with much tighter margins. As a result news organisations are “much less able to take the risk of sending reporters out on a project that might not produce a viable story,” he said. I don’t think it is impossible at to make it happen in places outside of the US though. It just requires energy and ingenuity. Click here for more on ProPublica and how it is funded. This entry was posted in Business, Events, Investigative journalism and tagged #news2011, Global Editors Network, Paul Steiger, propublica on November 29, 2011 by Rachel Bartlett. Consultant Jim Chisholm gave a jam-packed presentation to the Global Editors Network news summit in Hong Kong today. His presentation (which I will link to here once it is available) offered plenty of facts and figures about the state of the industry across all platforms, but focused on how improving the approach to digital content can also help provide a secure future for more traditional forms. “There is no evidence that the internet is the cause of the circulation decline”, he said. According to the statistics for online given in his presentation the rate of ad spend per hour was £8.20 online but £23.50 in newspapers. And the time spent by the audience consuming media was still top for newspapers, although overall this is in decline. Television is increasing its share but not time, the amount of time internet is consumed is leveling off. People are not spending more time [consuming news] despite all the platforms available. Print circulation was also said to maintain a key share of revenues, but he said that it “has been forgotten”. The reason it’s going down is because nobody cares. It is a really serious problem. Chrisholm told the conference that “forecasts suggest by 2017 mobile will deliver around 24 per cent of all digital advertising”, but “the forecasts are wrong”, he said, adding mobile use will be a lot higher. Mobile is a second evolution. As well as wireless capabilities mobile offers multimedia and location features that can exploit the personalisation trend. Also looking at tablets, he said growth in this area is “absolutely enormous” adding that Le Monde told him “reading times on tablets are as high as those reading print newspapers”. Put simply, “paywalls will not work”, he told the audience. But the newsstand formula could be the answer. It will work online if everyone works together [and offers content] all in one place. That is a solution that could work. In a competitive market people can choose to go from one place to another. Because of our reluctance to take on board the concept of analytics, that’s what’s holding back our ability to develop digital. We are not exploiting the medium in the way it is meant to be exploited. … The reality is unless traditional news media adopt scientific approach to customer retention and intensity, they’re dead. In conclusion on the topic of analytics he told the audience of editors “you can all do this,” and added that “tailored content will dramatically transform the industry”. This entry was posted in Events, Journalism, Online Journalism and tagged #news2011, digital journalism, Global Editors Network, Jim Chisholm, Online Journalism on November 29, 2011 by Rachel Bartlett. In one of the first sessions at the Global Editors Network news summit today the panel discussed paywalls and paid-for apps. 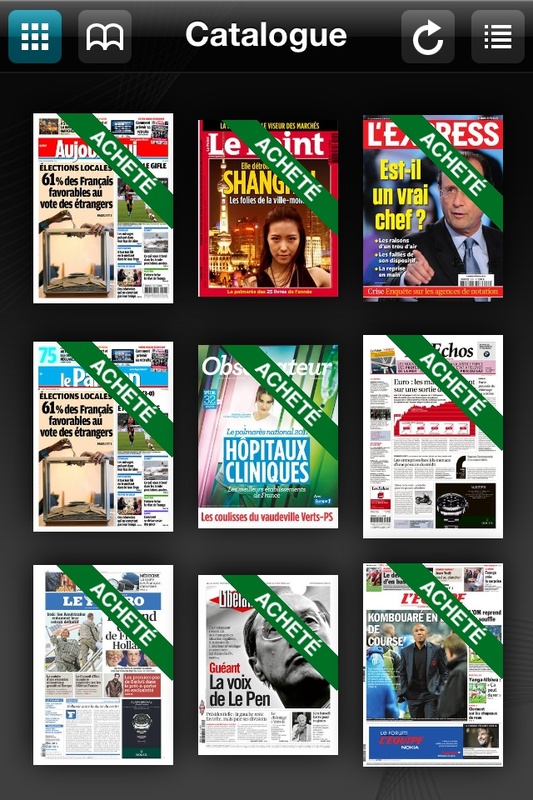 One of the speakers was Frederic Filloux, general manager of ePresse Consortium, the “digital kiosk” or newsstand from ePresse which launched in July this year after just six months of development by a two-man team (the catalogue section of the iPhone app is shown in the screenshot on the left). Filloux gave an interesting insight into the model and the online challenges of the industry in which it performs. He said the kiosk has a “news DNA”, leaving the leisure magazine market to other outlets. During the session the speakers also called on editors to experiment with numerous revenue streams, and find their unique market. Fellow speaker Madhav Chinnappa, head of strategic partnerships for Google News, added that “the solution is going to be unique and individual”. In my personal opinion the most successful paywall has probably been the Financial Times, but they have a unique set of circumstances. It took them years to develop their paywall, trying different things. They spent a lot of effort around customer data. They come from unique position. I don’t know any human who pays for a subscription to the FT, it’s companies, so that’s going to be different from most newspapers in the audience. This entry was posted in Business, Events, Journalism and tagged #news2011, digital subscriptions, ePresse, google, kiosk, newsstands, paid content, paid-for content, paywalls on November 29, 2011 by Rachel Bartlett. An interesting part of the visual journalism session at the Global Editors Network summit in Hong Kong today looked at where animation can work with news, by hearing about the work of Next Media. The company, which is based in Taiwan, produces animation clips based on news events. One of their clips, which depicted a story relating to golfer Tiger Woods has so far received seven million views. Content and business development manager Mike Logan told the conference the animations aim to offer a “fuller picture of events we believe happened at the time”. That’s how we use animation at Next Media, animating the missing action. Doing news reporting you have an interview but it’s missing a crucial piece of video and that’s action not happening. He also discussed News Media’s distribution platform News Direct, which offers –free of charge – “more traditional animation to help supplement video”. This can simply be downloaded by news outlets and added to their own video work. Next Media’s own animations are also embeddable, such as this one Journalism.co.uk posted on its blog in February to illustrate the sale of the Huffington Post. Find out more on Next Media here. This entry was posted in Events, Journalism and tagged #news2011, animation, Global Editors Network, Next Media, Visual journalism on November 28, 2011 by Rachel Bartlett. In this morning’s sessions at the Global Editors Network summit an interesting discussion took place which aimed to look at the lessons from two major events in the past year: the Arab spring and Fukishima. Focusing first on the Arab spring, Al Jazeera English’s head of online Mohamed Nanabhay told the conference that social media “amplified” the voices of those involved and helped citizens “reach out”, and once the media started reporting “people felt braver” to do so. Once mainstream media came in it reached 90 per cent of society, this provided an effect … people felt braver because the media were covering it, and they felt if the media are covering it hopefully there are checks and balances on power. Moving to the issues in Japan, fellow speaker Joichi Ito, director of the MIT media lab, accused the mainstream media of “not digging very deep” in its coverage of Fukishima. Today people are very disillusioned. There is a huge loss of confidence in media and official sources. He also called for greater integration of programming, data analysis and statistics in the newsroom. I don’t think most media has the practice of doing data analysis … in Japan need journalists to look at the data and not at the experts. Nanabhay added news outlets need to “inspire curiosity in journalists”. It’s very difficult for people to step back and think about the story further than the deadline. Editors need to allow journalists to step back, go beyond the wires and press releases. They need the ability to think critically about the problem, to be a problem solver. The environment might have changed … but if you have curious mind that’s what you really need. Interestingly, in following his comments on curiosity in journalism, he said that when it comes to traffic Al Jazeera “keep numbers away from journalists”, explaining that the broadcaster does not seek to measure stories based on traffic results, so as not to influence the stories journalists wish to cover and to let their curiosity be decided by the need for stories to be told, rather than those which may appeal to more eyeballs online. This entry was posted in Events, Journalism and tagged #news2011, Arab Spring, Fukishima, Global Editors Network on November 28, 2011 by Rachel Bartlett. Opening the Global Editors Network summit today, the chief executive for Hong Kong Donald Tsang called on the international media to make the most of its rich technology and business sector, but added he did not envy the job of news organisations as they “find new ways to make their business work”. In his keynote speech Tsang shared some interesting statistics on Hong Kong’s media, which he said has 50 daily newspapers and at least 100 international media outlets based in the region, in which he said news and information “flows rapidly and freely”. He also told the conference that Hong Kong has a 201 per cent mobile phone penetration, with many citizens having more than one phone, setting an interesting scene for mobile discussions scheduled to take place later today. He closed by speaking about the challenges facing the industry, adding that while “information technology was meant to make life easier” it appears that “life gets busier and busier” for both the media and government. Referring to a law passed earlier this year to establish a communications authority, he said one of its first tasks “will be to review and rationalise our laws on broadcasting and telecommunications” and address “cross media ownership and foreign ownership restrictions”. I hope that responding to changes and advances … we’ll be able to foster development of the sector. I hope this will also encourage innovation and investment. As I said earlier the free flow of news and information is of strategic importance to us. 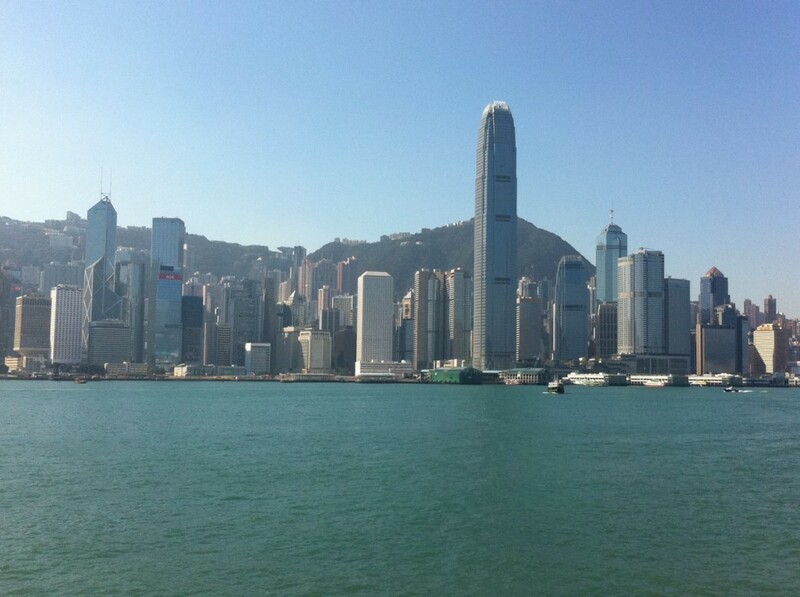 We very much welcome more international media to take advantage of what we have to offer in Hong Kong. … News organisations need to find ways to make their businesses work … We no longer live in 24/7 environment, now it is measured in minutes or seconds and this must create enormous pressures. I don’t envy your jobs. This entry was posted in Events and tagged #news2011, foreign journalism, Global Editors Network, Hong Kong on November 28, 2011 by Rachel Bartlett.